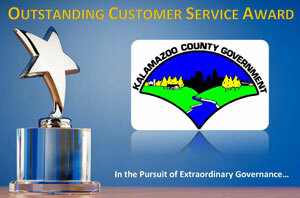 In the pursuit of extraordinary governance, Kalamazoo County Government strives to recognize our employees and their efforts to provide stellar customer service inside and outside our organization. As a result, we have implemented the "Outstanding Customer Service Award". If you would like to nominate someone for this award, please click here and complete the online form. Must be a Kalamazoo County Government employee, excluding elected officials and appointed individuals. The employee must have projected courtesy and respect towards his or her customers and coworkers. Overall, the employee must have demonstrated outstanding performance and must possess a favorable work record. Twice a year, the Human Resources Department will review all of the nominations and select the candidate to receive the Outstanding Customer Service Award. A letter of appreciation to the employee from the Kalamazoo County Administrator/Controller. A letter of appreciation to the employee's family from the Kalamazoo County Administrator/Controller. A service recognition article to be published in the County Connection Newsletter and the County website. Recognition at a Kalamazoo County Board of Commissioners' meeting.